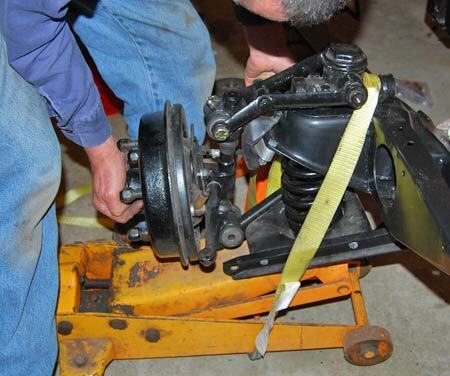 The job of removing coil springs from in between the upper and lower control arms of a classic car's front suspension is a task that throws fear into the minds of many hobbyists. This is because it is not uncommon to hear stories about home mechanics who unbolted suspension parts, allowing coil springs to rapidly decompress and fly wildly through the air. Those innocent looking coil springs are under a great amount of tension which, when released suddenly, can launch them towards humans, floors, walls or roofs with tremendous force and speed. In an instant, a suddenly free coil spring can send a lower A arm crushing down on the toe of the mechanic who unwittingly pulled the pin out of the control arm. Even when using the simple and safe removal tip we are going to share with you, it is a good idea to don protective gear when doing this job. Steel-toe boots, leather gloves, shin protectors, kneepads, hard hats, face shields and such are all good ideas when disassembling a front suspension. Given the potentially hazardous nature of this project, read and re-read this article and make sure you understand it before continuing. A coil spring compressor is the tool that most hobbyists think of first when dealing with this job. Most of these are "screw jack" devices that have "ears" to clamp on the coils near the top and bottom of the spring. 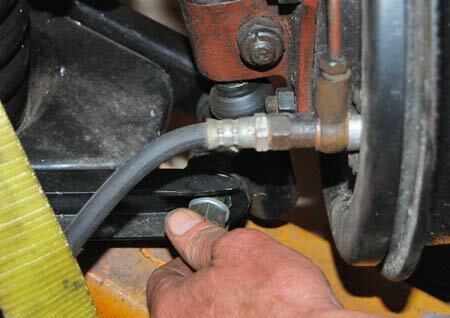 As you turn the screw jack mechanism with a wrench, the ears move closer to each other and compress the spring. Some spring compressors are designed to clamp on the outside of the spring and are often used in pairs so both sides of the spring compress uniformly. Some are designed to go down the center of the spring, after the shock absorber is removed (assuming the car has telescopic shocks). On these there is an ear on each side of the screw mechanism so both side of the coil spring can be grabbed and pulled together uniformly. There are a few concerns with such tools. First, you have to buy an extra tool. In addition, the tools are not designed for the specific car and it can be hard to fit the ears securely on the coils. If they do not grab securely, they can slip off. Sometimes other suspension parts get in the way of the tool. And with many old cars, the telescopic shocks are rusty and may not remove easily, making it impossible to put the tool down the center of the coil spring. The simple technique we have adopted for this job requires a floor jack, which most hobby restorers have, and a set of the ratchet style tie-down straps used when trailering collector cars. You need fairly hefty straps and not the flimsiest ones, but the web type we use can be purchased at most big box stores for under $20. That's less than the cost of a spring compressor. What you do with these is pass a tie-down strap under the base of the floor jack so that you have enough strap left on either side to wrap the straps around the upper and lower A arms. Pull the straps neatly around the suspension parts and put the strap through the ratchet, take up your slack, then ratchet them around the two A arms. You don't have to make them real tight yet. Next, pump the handle of the floor jack so it rises up against the lower A arm. You may want to use padding so the finish on your suspension parts doesn't get scratched. The frame of the car won't lift because it is strapped to the jack, so the jack will hold the lower A arm in place. Now, you can safely remove the outer pins so the end of the A arm is free. Then you slowly let the jack down again. As it lowers, the coil spring will gradually decompress until there is no force left. Then you can undo the tie-down straps. 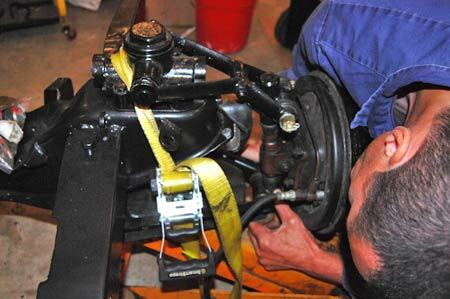 The lower A arm will probably drop down and the coil spring can be removed. 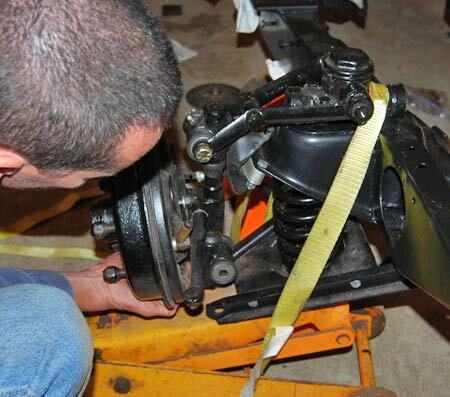 Later, when you are ready to reassemble the front suspension, you simply seat the coil spring between the A arms, strap everything together the same way, raise the lower A arm into position by pumping the floor jack and reinstall the pin or install a new one. Once the suspension is all pinned together with fasteners installed, you lower the jack and remove the straps. The tie-down strap around the jack holds the A arms and coil spring safely in their proper positions so mechanic Vince Sauberlich can position the lower end of the spindle and put a new pin through the bolt hole in the lower A arm. Sometimes getting everything in just the right orientation takes a bit of jockeying, but the tie-down straps around the jack provide a very secure method of holding the compressed spring so that other parts can be safely attached. With the bolt holes in the lower A arm lined up with the bolt holes in the spindle, Vince was able to pass the bolt or pin through the holes in both parts so that they were firmly connected and the tie-down strap could then be removed. Here the big nut is being spun on the bolt or pin that secures the lower A arm to the spindle. Note that different automakers use different names for the parts. On this MG the spindle is a "swivel pin" and the bottom pin is a "bolt."